So when I picked up the Green DT Code OTP a couple of weeks ago the seller had a SJG that was dusty and sitting off in the corner of his garage. I made an offer and picked that up too. Finally got around to cleaning it up and decided to try a cook I’d normally do on a 22. Wanted to see how many chicken wings and ABTs I could get on a 13 inch SJ Grate. As it turns out, using a brick to separate the coals from the cooking area I got 5 wings and 4 ABTs. Chicken wings throw a lot of fat which can make a mess of your kettle bowl. I’ve started to line the bowl with aluminum foil, being sure not to cover the vents to make for an easy clean up. I also wanted to get as many lit coals as I could into the Smokey Joe but wanted them banked to one side because we want a lot of high indirect heat. If we place the chicken wings over the coals we’ll end up with burn skin (not good). In this picture you can see how the brick keeps the coals on the left side of the kettle. we will be placing the ABTs and Wings on the opposite side of the coals. The wings were done internally but I put them directly over the coals for a couple minutes to crisp up the skin. Done. Plated on my finest china. 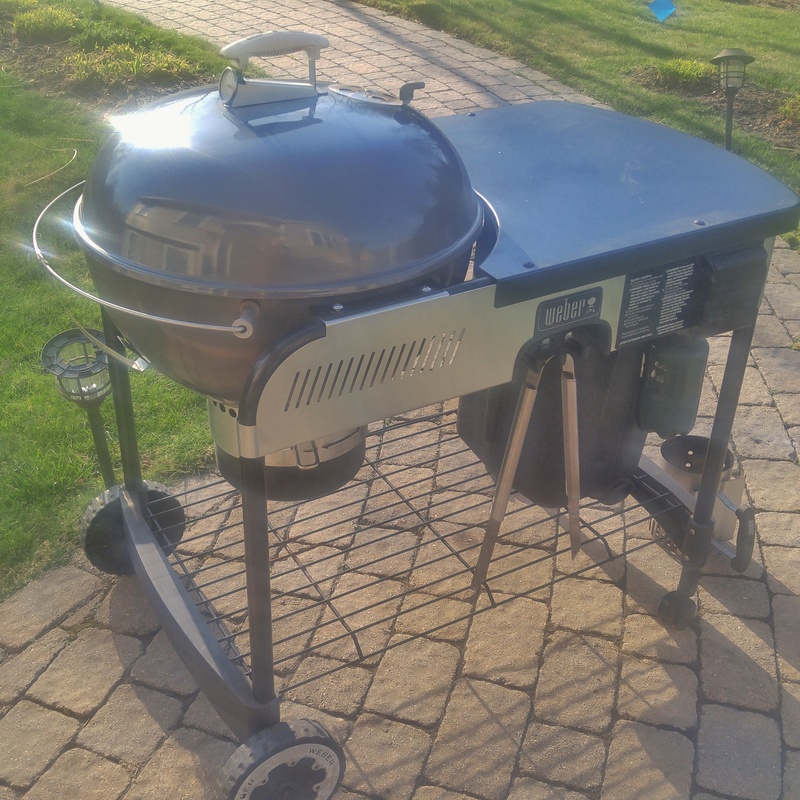 The Smokey Joe Gold is for sale for $20 if anyone wants it. I already have a Smokey Joe. They sell for $40 and this one is in great shape as you can see. Zero chance that a little snowstorm is gonna keep us from hitting the Weber Performer with some Atomic Buffalo Turds. Three medium russet potatos pierced and microwaved for three minutes on each side. then cut in half, broken up a little by inserting a fork and twisting. Then coated with peanut oil and adding a dusting of coarse salt. Placed offset a full chimney of briquettes in the charcoal baskets on the opposite side of the grill. Close lid and come back 30 minutes later. Rebrush on some peanut oil and put a little char on some jalapeno halves. Place some chopped up onions on the potato crisps. Next place the charred jalapeno halves on the potatos and cover with shredded Mexican cheese. cover and let the cheese melt in. First wrapped the russet potatos in tin foil and tossed them right on the hot lump charcoal. After 10 minutes flip the potatos on the other side and let them go for another 10. Once the potatos are done, unwrap them and put them to the side and put a little char on your core and seeded jalepenos. Next cut a flat bottom off your baked potatos and then cut a criss-crossed section off the top which is the entry point for hollowing the potatos out. Next insert your charred jalapenos into the hollowed out baked potato. Stuff a stick of your favorite cheese in the jalapeno. You can use whatever cheese you like. I chose cheddar sticks but you can use shredded too or even cream cheese. When placing on the grill cook them offset the coals. Here’s my daughter Eloise helping me make the Volcano sauce which consists of sour cream mixed with hot sauce and you can sprinkle in some cayenne pepper. You just keep adding and mixing til you get to the heat you want. After 20 minutes offset turn the potatos on the grill so the side that was facing away from the coals now face the coals and slather on a bit of your favorite BBQ sauce. Once they are crisped up take them off and dollop on the volcano sauce. Watch it drip down and the cut in and enjoy. Set Up A Full chimney of blazing coals in the charcoal baskets in the center of the Performer with a handful of cherry wood chips. Opened teh vents wide and let ‘er rip for about 35 minutes. Wings dusted with Paul Prudhome Blackened rub. Using 80% full Weber Rapidfire chimney of KBB in the charcoal baskets situated in the middle of the kettle. Placed the wings around the edges for indirect high heat cooking. Vents wide open with a chunk of hickory over the coals. We will check em in 30 minutes. Here’s they are in all their crispy on the outside-juicy on the inside goodness!